History makers radio has featured some of the most amazing stories over the years, from many amazing people. 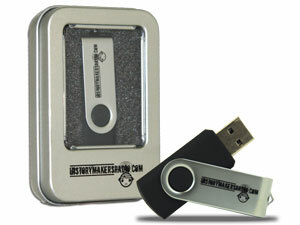 On this USB Flash Drive you can listen to 20 of the best interviews with Matt Prater. They include Chief of the Defence force, General David Hurley, Winner of Masterchef 2011, Kate Bracks, Former Olympian, Elka Whalan, Producer of the Bible series & Survivor, Mark Burnett, & Musicians like Paul Colman, Mark Shultz & George McCardle from the Little River Band. Be inspired by their stories of faith, overcoming & success. This resource would be a great tool for outreach, and once you own the USB, you can share the interview in electronic form with whoever you like! Maybe their stories will inspire you to be a History maker! For a full list of the interviews go to historymakers.tv The price is only $19.95, and all funds raised goes straight back into History Makers to help with future programs on radio and on TV!